Kasha Tours ,one of the most well known companies in the tourism industry in Egypt, has been in business since 1985,members of ASTA , IATA , JATA ,VITAA, FUAAV and COTAL. Kasha Tours is a specialized tour operator in inbound tourism and handling incoming visitors from different parts of the world ; United States of America , France , Turkey , Russia , Germany , Italy , Belgium , Czech Republic , Romania Latin America , the Gulf Region and North Africa. Kasha Tours believes that Customer service is the key to success, our job does not end with your reservation it just starts. Our staff is available to answer any questions or comments you might have on 24/7 basis until the end of your trip . With Kasha Tours there is no need to shop around for a great deal we will provide you with the best most comfortable accommodations that suits your budget, from an exclusive VIP services to our valued clients including , access to VIP airport, private 5 stars catering and unlimited facilities in transportation (private limousines , mini vans and 50 passenger busses). We also offer budget tours and stays for economy tourists as well as special interest tour and incentive travel convention with seminar and conference options. Our main branch is located in Alexandria with an extending branches in Cairo, Sharm El Sheikh , Hurghada and over 65 cheerful fun-loving and caring multilingual staff members to make your valuable vacation nothing less than wonderful. 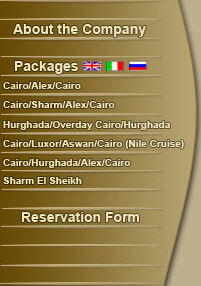 These coming pages will bring you the best possible price for programs , cruises airfares and classical packages. Thank you for visiting our site, we are looking forward to making your valuable, unforgettable dream vacation come true.